Volcan Defend the Tower is a third-person Sci-fi shooter from Processor Game Studio. Play as Sollum to defend your Volcan Towers against your enemies while exploring a planet earth with nature restored due to years of humanity’s absence. 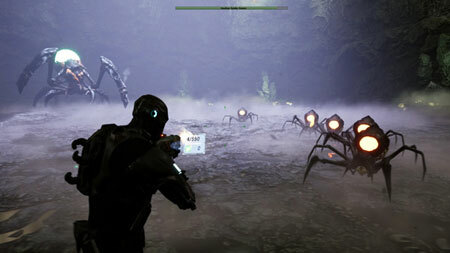 Survive the Ganthar sieges to your base, and recall your past events by exploring the dangerous Waipoua forest. But this restoration of nature brought surprises, the irrational alien race Ganthar has spread to the planet infecting a deadly gas harmful to humans. The game features realistic graphics in a gigantic open world with hours of exploration and wild combat. Find, activate and use all your firepower to defend the Volcan Towers, you are the last hope of the Vanguard. The game features a gigantic open world free to be explored with hundreds of enemies and items. Upgrade system of character and turrets with more than 30 different abilities. If you get stuck in the game, check out the video walkthrough and gameplay for the game. This entry was posted in PC Games, Walkthrough and tagged Volcan Defend the Tower Cheats, Volcan Defend the Tower Gameplay, Volcan Defend the Tower Guide, Volcan Defend the Tower Strategy, Volcan Defend the Tower Walkthrough by Marvin. Bookmark the permalink.